The most common and economical method of printing is full-colour Digital Printing. The colours are vibrant and the fine details are sharp. All of our product pricing is based on single-sided Digital Printing, which provides the most versatility and quick turnarounds. We do have the option to print double-sided if you prefer - please contact us prior to ordering and we can send you printing costs! If you’re wanting simplicity but also want a pop of colour, consider White Ink Printing. It allows you to choose a bold, colourful paper stock (or even grey, black, brown kraft, or Translucent Vellum). We have so many stock colours to choose from! White Ink Printing has quick turnarounds and is priced slightly higher than Digital Printing. Side note: How amazing does White Ink Printing look on the texture of our Oxblood burgundy envelope? Heat-Reactive Foiling is such a great option if you have a limited budget, but still want gorgeous foiled stationery! The price is much lower than Hot Foil Stamping, but it does have a couple of limitations, such as paper thickness and paper texture. There are loads of foil colours available, including gold, rose gold, silver, copper, and so many more! We can create any size card with this process, and can even print and foil double-sided. Please contact us for more info! Who doesnt love a beautiful Letterpress invitation? Feeling the impressions in the paper is such a luxurious experience, which both you and your guests will love. 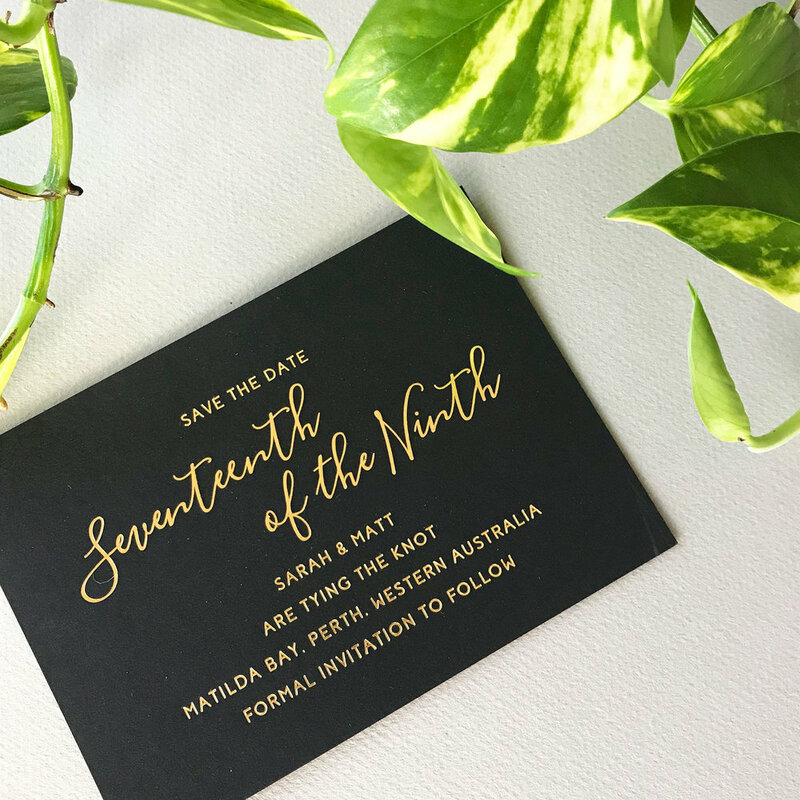 Because Letterpress designs are created with a metal plate, we are not able to include variable data (such as different guest names printed on each invitation). Letterpress comes with a higher price tag and longer turnaround times, but the 500 year old process is still popular for a reason. Created in a similar way to Letterpress, Hot Foil Stamping is a popular option for weddings of all styles. It does come with the highest price tag, but the results are stunning. We have foil available in every colour imaginable - including rose gold, silver, gold, copper, and many more. Similar to Letterpress, this printing process involves the creation of a custom metal plate. However, unlike Heat-Reactive Foiling, with Hot Foil Stamping we have the ability to foil directly onto thick, textured paper - even coloured paper stocks. For the couple who prefers something different, Translucent Vellum is a lovely option. It is fairly versatile, with the ability to print full colour, black ink, or white ink. The vellum looks great on its own, but also looks gorgeous when layered on top of a coloured card. It typically has fast turnarounds and costs slightly more than standard Digital Printing. Our Handmade Cotton Paper is one of our favourites; it allows for full colour printing but the deckled edge adds an extra level of beauty. Because this stock is handmade, no two pieces are the same. It typically has quick turnarounds and is priced higher than Digital Printing, but lower than Letterpress or Foiling. We also offer Handmade Cotton Paper in a black colour, which looks amazing when combined with our lovely White Ink Printing option. The above dimensions are our standard sizes. We are able to print items at custom sizes, including accordion-style multi-panel invitations, but this will require a personalised quote. Feel free to contact us if you have a specific size in mind and we will be happy to help! We also have a variety of coloured envelopes available, including metallic options. Prices of coloured envelopes vary depending on the colour and brand; please contact us for coloured envelope pricing! We charge a flat rate $20 AUD shipping fee to all customers in Australia. We are able to ship internationally to most other countries for a flat rate of $55. Please view our Shipping page for more information. We can also cater to the DIY brides - on a budget! If professional printing isn't an option for you, we can provide you with a digital file that you would print yourself. Contact us today for a price on our printable designs! A selection of our designs have printed samples available to purchase. Samples are a great way to check out the paper quality and colours before ordering your full stationery suite! The price for a sample set of an invitation, RSVP card, and two envelopes is $5.95 with free shipping. ...and anything else you might think of!